5:30 am… the coffee is brewing…. Turn on the computer and yep, there’s another email asking what type of mats I should run in my stream sluice. It’s not that we don’t love helping people; it’s just that this question is lot more complex than most realize. In fact, besides specking out a commercial op, I think this one takes more explaining than most. So, if you sent us an email with that question there’s a good chance you are reading this because I decided to go DEEPER into the subject and help you understand the factors. I’m posting a short video at the end. Before you begin… I strongly encourage you to watch after the Proportional Force video. It will open your mind and help you understand. Also… I will make this statement… I BELIEVE THAT OUR STREAM SLUICE HAS THE HIGHEST RUN RATE OF MATERIAL COMPARED TO ANY STREAM SLUICE ON THE MARKET WHEN STARTING WITH UNCLASSIFIED MATERIAL. Let’s face it, I can go to a creek or stream and within 50 feet have VASTLY different flows in my stream sluice, anything from a small trickle to a raging water flow. Sometimes I show up at creek that was flowing great last month, but this month has drained down to a trickle. Unlike a highbanker that uses a pump with a steady constant GPH, a stream sluice flow varies on a daily basis. Plus, there is no way really to measure the GPH. It’s more of a “visual energy” sort of thing. 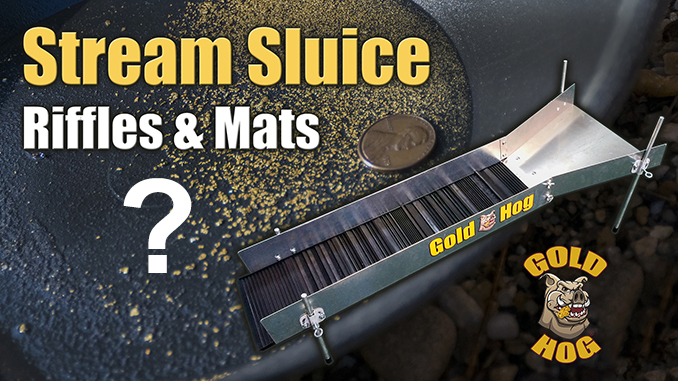 OUR SOLUTION: Make a stream sluice PACKAGE that has both regular flow and low flow mats. Regardless of the flow you have the right matting. When you set up a stream sluice most of the time the END of the sluice will be under water. Often the END of our sluice is 3 inches deep in the creek while the upper portion, the flare, is barely skimming water at the surface. Because the end is under water and deep there is a natural BACK PRESSURE that occurs. This pressure / reduced flow slows down the speed of the water, makes the water DEEPER, and actually hinders the exchange and clearing of the sluice near the end. OUR SOLUTION: At the end of both our mats for our stream sluice package you’ll notice that we use Bedrock and UR matting or a matting that has NO TALL OBSTRUCTIONS that might grab rocks that are trying to clear. 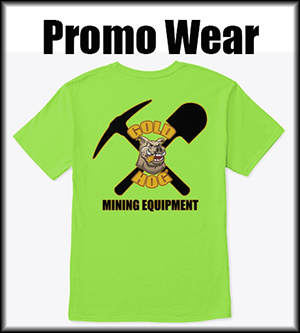 If you know anything about my philosophy in gold mining it’s based on some fairly simple rules, one being that moving more dirt EFFICIENTLY… gets you more gold. Again, not just moving a lot of dirt but doing so at a capture rate that meets your goals. Next, time is money. If your boss asked you to work for $2 an hour you’d tell him to go pound sand. Yet in prospecting and mining we often fail to attribute a COST… to time. Often this is due to the fact we are doing it for fun and really don’t care. Some of time it’s that we don’t understand how the right equipment and processes can SAVE valuable time and add to the end result. When you classify you really need to do wet classification to wash rocks and that can triple the time it takes to work a bucket of pay. ALL THAT BEING SAID… it reinforces why you have to watch the Proportional Force video. OUR SOLUTION: Make matting surfaces that allow the miner to run with little to no classification. I’ve said it time and time and time again… yes our stream sluice FULL PACKAGE costs more than most plain stream sluices out there. But… in the end you’ll pay the same or more if you try and get all the features ours offers. 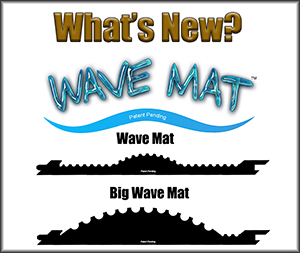 Not only is it a BEAST construction wise… but comes with two sets of mats, and a full leg kit that is one of the best in the industry. Being able to set up ANYWHERE quickly and fine tune is critical. The leg system we use does this. There’s a BIG difference between running river gravels in Colorado, running clay muck in Georgia, and running black beach sands in Washington or Alaska. Anyone that tells you differently doesn’t mine much. So, you’ll have to play around with flow settings, pitch, matting configurations as well as FEED RATES. REMEMBER… anything can catch gold and anything can lose gold, it’s all about the fine tuning. FYI… if you are running nothing but beach sands you may want to run Motherlode mat. So what mats to use? For MOST people… converting over a traditional sluice, I would go with a couple of Talon mats at the very top… then transition into something smoother like Motherlode. Your material will have good energy coming off the flare, but it starts to lose it quickly. That’s why you don’t want a bunch of OBSTACLES… i.e. riffles or aggressive matting further down your sluice. How often should I clean out my mats? Normally we don’t worry about this much. 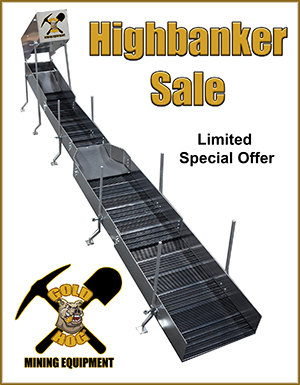 Example… If we’re running a highbanker we only clean out twice a day. But, with a stream sluice you often have varying flows and crazy turbulence. So I encourage clean outs more frequently. When running a stream sluice I clean out every hour. 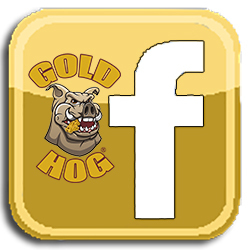 Remember… with our leg system and matting system this is a VERY FAST AND EASY PROCESS. Watch the videos to see just how easy it is. Now I think you can see why I PAUSE……. When responding to emails about stream sluices. It’s because there are SO MANY variables and many beyond our control.